FoksMarx recolorLE is a feature reduced free version of our commercial recolorST plugin filter. 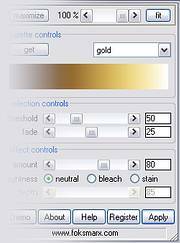 recolorLE uses the same color matching technology as the fully featured recolorST plugin. It lacks some of the advanced features like dual palette processing. Still it is a fully functional plugin filter that you can use for both your private and professional graphics work. Check the comparison table to find out which version is right for you.